This checklist includes all species of earthworm known to occur in natural environments (i.e. in the wild) in the British Isles and was compiled by Keiron Derek Brown, Chris Raper and Emma Sherlock on 3rd March 2018. There are 31 species of earthworm known to occur in natural environments within the British Isles, though only 29 species are known to occur in Great Britain. 1. Microscolex phosphoreus is an earthworm known to occur in the UK and thought to originate from South America. It is believed to occur very rarely in the UK and therefore a voucher specimen is required to confirm any records of this species. 2. Allolobophora chlorotica exists in two distinct morphs: green and pale (or pink). These morphs are recognised to differ in their ecological preferences, though both are relatively common and widespread. Where possible, the colour morph should be recorded as it possible that these morphs may be re-determined as distinct species in the near future. Once preserved, it is not possible to tell the colour morphs apart so the colour must be recorded when observing a live specimen in order for the morph to be recorded. 3. Aporrectodea caliginosa was previously known to exist as a distinctly different morph: nocturna. This morph is an anecic earthworm, whereas A. caliginosa is typically an endogeic earthworm. Research that is due to be published in 2018 has demonstrated through both molecular and morphological work that the nocturna morph is in fact a distinct species: Aporrectodea nocturna. A. nocturna can be distinguished relatively easily as it is generally larger than A. caliginosa and has a deep red colour, but records of both species should be accompanied by a photograph where possible. 4. Aporrectodea cupulifera and Kenleenus armadas are known only from Ireland, and not from mainland Britain. Both species are thought to be very rare and a voucher specimen is required to confirm any records of either species. 5. Bimastos eiseni and Bimastos rubidus were previously named Allolobophoridella eiseni and Dendrodrilus rubidus, respectively, until 2017. They were re-classified according to molecular work into the genus Bimastos and are now thought to originate from North America. 6. Eisenia andrei is extremely difficult to separate from Eisenia fetida, and possibly only distinguishable through molecular work. 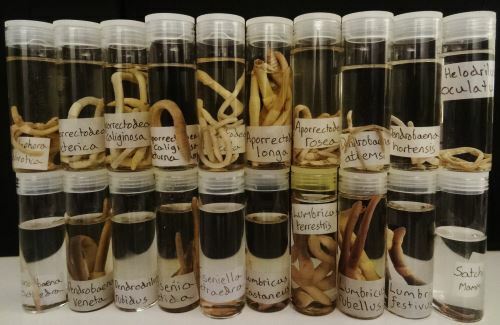 Some earthworm taxonomists believe that E. andrei and E. fetida belong to a single species. All Eisenia species records are currently recorded as Eisenia fetida, as an aggregate species until a reliable method for distinguishing between the two species is established. 7. Lumbricus friendi is a very rare species and a voucher specimen is required to confirm any records of this species. 8. Sparganophilus tamesis is an earthworm known to occur in the UK and thought to originate from North America. 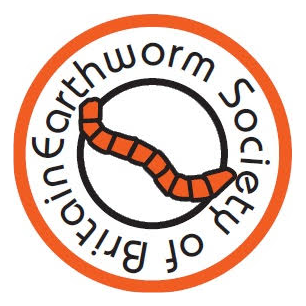 In response to two unverified records of S. tamesis the Earthworm Society of Britain undertook a site survey of the River Thames close to Goring-on-Thames (the type locality) in 2016 but no specimens of S. tamesis were observed. It is thought likely that the species is still present in the UK and a voucher specimen is required to confirm any records of this species.